Donate online using your Rupay, Visa or Master Card. To donate using other payment methods click here. For any donations or offerings in kind, you may also contact the Trust. There are many imposters posing as official representatives of Haji Ali Dargah Trust. They are present both online on the web and offline in person. By accessing the site and use of the information of this site, you agree to abide by the terms of the site. If you do not accept these terms, you should exit this site immediately by closing your browser. For detailed terms, please click here. The structure was erected on a set of high rising rocks and was given its present day shape in the early 19th century after the Trust was legally formed as an entity in 1916. 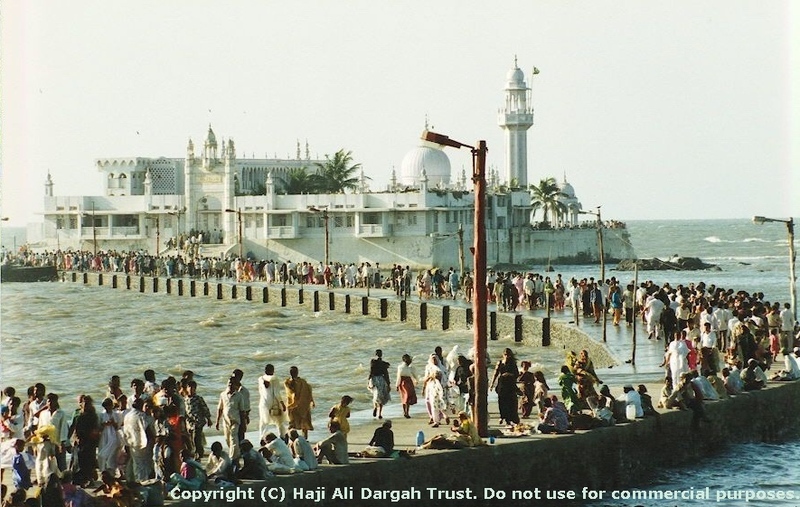 Haji Ali Dargah is the complex housing the tomb of the Muslim Saint Pir Haji Ali Shah Bukhari (R.A.). Along with the tomb, there is also a Masjid at Haji Ali. This monument has been sentinel to the shores of Mumbai since a long time. The structure has white domes and minarets reminiscent with the Mughal architecture of the period. The Dargah is a renowned pilgrimage site among the Muslims. Non-Muslims are also allowed to visit the Dargah. The white-coloured structure attracts visitors in large numbers. About 10 - 15 thousand people visit the Dargah daily. The number of visitors increases to 20 - 30 thousand, on Thursdays, Fridays and Sundays. Lakhs of devotees visit the Dargah on the second day of Ramadhan Eid and Bakri Eid (Eid-ul-Uzha), and during which the pathway leading to the Dargah Complex looks like a Sea of Humanity. People from all parts of the world without restrictions of caste, creed and religion visit the Dargah to offer their prayers and for the fulfillment of their wishes by the blessings of the Saint Pir Haji Ali Shah Bukhari (R.A.). Some pray for wealth, others for health, children, marriages, etc. have their wishes being granted at all the times. The Trustees of Haji Ali Dargah Trust have launched an online portal for Application for Annual Scholarships for Higher Education. The application process is now closed for the current academic year 2018-19. An announcement will be made in the summer of 2019 for the next academic year 2019-20. The URS (Death Anniversary) of Pir Haji Ali Shah Bukhari (R.A.) is on the 16th of (Rabi-ul-Aakhir / Rabi-al-Thaany) (17th Shab). The Trust as per it's objects performs all necessary rituals as per Islamic traditions and distributes Niyaaz (Food / Sweets) to all devotees, visitors and fakirs. A special program of Milad and prayers is held on the 16th of every Islamic Month after Namaaz-e-Isha (17th Shab) in remembrance of the URS of Pir Haji Ali Shah Bukhari (R.A.). The Trust distributes Niyaaz to all present. In celebration of Eid-E-Milad-un-Nabi - 12th Rabi-al Awal (Birth Anniversary of Prophet Mohamed (S.A.W.S. ), the Trust organizes a function for viewing the sacred relics of Prophet Mohamed (S.A.W.S.) post Namaaz-e-Zuhr. Prayers are recited (Fateha) at sunset (Maghrib) and Niyaaz is distributed. The Trustees of Haji Ali Dargah Trust sincerely thank all patrons, devotees and visitors of Pir Haji Ali Shah Bukhari (R.A.) for their magnanimous donations, contributions, aid and forthcoming support to the Haji Ali Dargah Trust and also for voting Haji Ali Dargah, the tomb of their favourite saint into the Top Seven Wonders of Mumbai . Copyright © 2009 Haji Ali Dargah Trust. All Rights Reserved.